Semi-finals day at the World Junior Championships had everything one looks for in a big tournament: big stars, promising new faces, upsets, nail-biting rallies and thrilling comebacks. It also assured us that this tournament would be without something that has now almost become a fixture at senior events : the all-Chinese final. On one hand, the girls? singles final was one of the easiest to predict. With China World Cup winner Wang Yihan in the top half of the draw and Philippine Open champion Saina Nehwal in the bottom and only two unknown and unseeded Korean girls standing in the way, a matchup of these heavyweights seemed a forgone conclusion. However, Saina?s challenger, Bae Youn-joo, had already knocked off the 2nd and 5th seeds on consecutive days. As expected, Saina looked to be in control in the first game, even if Bae did manage to stay close. Getting out to a 16-13 lead, the young Indian looked set to take the game home but Bae mounted a comeback and pulled ahead at exactly the right moment, creating a game point opportunity. When her net shot seemed to catch Saina flat-footed, Bae spun around to celebrate her victory, even as the line judge was calling the shot out. A few points later, it was Saina?s turn to feel robbed as she as she protested a call in Bae?s favour to no avail. She kept her cool, however, and finished the game 25-23. The second game started much the same way the first one ended. After the umpire ignored another line call protest from Saina when she was down 5-2, she quickly got her head back into the game and took the match with a 21-13 second game win. While both girls turned 16 this year, Bae was obviously the less experienced and was very happy to have done so well in this, her first ever appearance in an international event. ? I was aiming to reach the Round of 16 ,? she confessed after the match. Once again, Wang Yihan seemed to have a little trouble early in the first game, this time in moving the tall, lanky Kim Moon-hi around the court. Wang overcame the problem by the end of the game, though, and looked even more in control in the second as she took the match 21-16, 21-13. After the match, Kim said that Wang?s height and speed make her a very difficult opponent but she feels that if she trains hard and prepares well mentally, she has a chance of beating her in the future. Kim was still happy about her quarterfinal victory over Han Li, who had beaten her in the same round in the Asian Junior Championships in July. 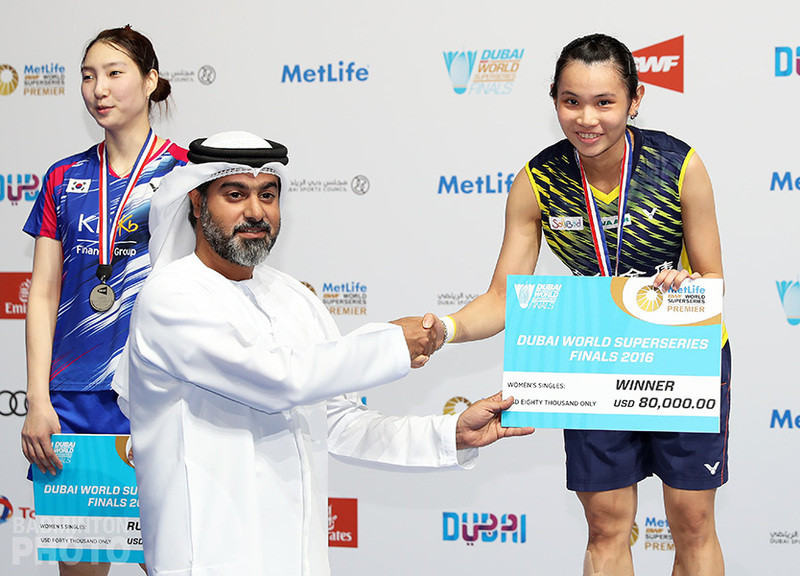 Kim said that the hometown crowd, while only a few hundred strong, was large by Korean standards for a weekday badminton tournament and that it helped her game. Zhou Wenlong, who had defeated top seed Tago Kenichi a day earlier, came out of the blocks strong against Korean Hong Ji-hoon. Zhou was leading 18-14 in the first game, when the umpire had to ask the line judge several times for the call, which she finally made in favour of the Korean. An incredulous Zhou came back to the game with a vengeance and finished it quickly and aggressively 21-15. The second game was Hong?s turn to be aggressive, however. By the end of the game, Zhou was on the ropes. When he wasn?t defending against Hong?s punishing smashes, he was scrambling to retrieve Hong?s own deft short returns. Hong finished strong at 21-8. At 9-9 in the decider, another very late call came from the same line judge only after Zhou had made the ?out? sign with his hands in an obvious attempt to influence the call. The umpire ignored the line judge?s late call and, after the service judge called it in, refused Zhou?s call for the tournament referee. Zhou got fired up and took the next point but the game stayed close after that. Down 17-20, Zhou managed to save one match point despite breaking a string but on the following point, he sent one into the net and Hong booked his place in Saturday?s final. The other semi-final was a rematch of the team semi-final 6 days earlier in which Lu Qicheng had beaten Tommy Sugiarto quite handily. In the first game on Friday, however, Tommy seemed to be getting all the breaks. Whether it was the close and late calls by the line judges or the shuttle hitting the tape, it all seemed to go Tommy?s way whenever he needed it to. He also seemed to have a little more altitude on his leaps and a little more zip on his smashes and overall seemed determined not to let Lu control the game as he had the previous week. He squeaked through the first game 21-19 and in the second, more acrobatic playing kept Sugiarto ahead and he finished 21-16 with some fine flying backhand clears and other incredible maneuvers. Tommy said that his fighting spirit made the difference in the semi-final and allowed him to improve so markedly on his previous performance against Lu. 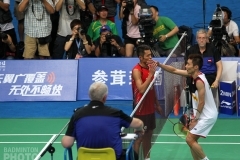 He said he was not worried about the partisan crowd in the final against Hong Ji-hoon. ?The only game I will be playing will be inside the court and in my head,? he insisted confidently. With their opponents seeming to struggle all week just to score in double-digits, it was no surprise when top seeds Lee Yong-dae and Yoo Hyun-young finished the first mixed doubles match, against Liu Xialong and Liao Jingmei decisively, by a score of 21-14, 21-9. 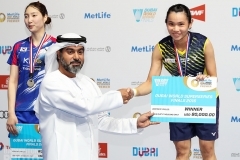 The mixed doubles became a complete non-issue for the day when it was announced that Li Tian and Ma Jin would advance to the finals automatically the following day with the withrdrawal of Hu Wenqing. Wang Si Yun and Liao Jingmei led throughout the first game of their girls? doubles semi-final against Koreans Sun In-jang and Hong Soo-jung but the Korean girls came back from 16-19 down to win 22-20. With Korea keeping up the pressure in the second game, the Chinese just couldn?t get anything going and became frustrated by several line calls on the way to losing by an remarkable 21-9. While top seeds Ma Jin and Wang Xiaolong had more luck in their semi-final against Pia Berbadet and Nitya Krishinda, the Indonesians did not make it easy for them by any means. 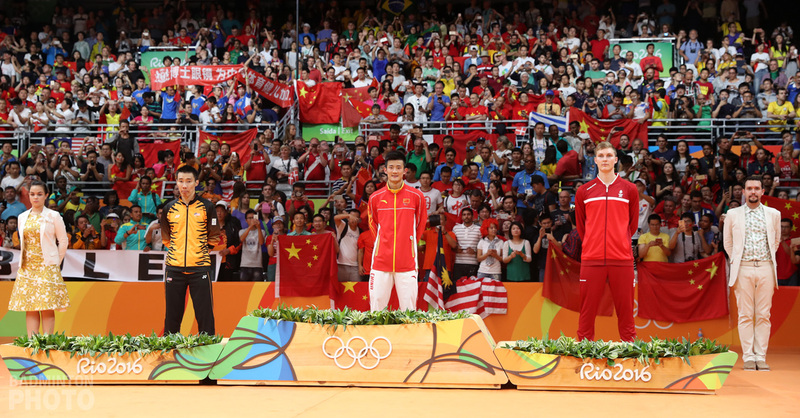 The score stayed close with the Chinese winning 14-11 before the top seeds finally pulled ahead and won 21-14. The Indonesian pair got out to an early 5-1 lead and stayed close even after the Chinese, predictably, pulled ahead. The final score of 21-17 made for a much more respectable margin than the 21-6, 21-13 by which they had lost in the team semi-final last week. It seemed there was nothing Lim Khim Wah and Mak Hee Chun could do to stop the Koreans? onslaught in the boys? doubles. Lee Yong-dae and Cho Gun-woo kept the Malaysians lunging to the front and backpedaling to the back and returned every single smash. It was over almost as soon as it began with the Koreans winning 21-6, 21-11. Semi-finals day finished with what was by far the closest and most exciting match of the day: Liu Xialong and Li Tian of China versus Kim Ki Jung and Lee Jung Hwan of Korea. The first game came right down to the wire. Li and Liu had two game points at 20-18 but the Koreans tied it up when Liu flubbed a smash. The Chinese then took two straight points to win 22-20. In the second game as well, neither team could get much of a run going. 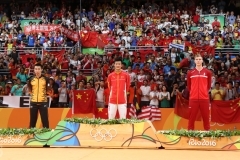 By the time China led 11-10 at the interval, neither team had had a lead of more than 2 points. Although the already small crowd had dwindled slightly by the time of this last match, the drama unfolding on the court gave rise to more enthusiastic cheering as the Korea pair struggled to even the game score. A thrilling fast-paced rally finished the game 21-19 when the shuttle finally sped into the Chinese side of the net. 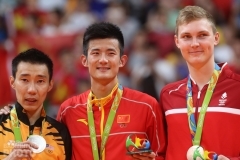 The Koreans came on strong in the decider, aided by the increasingly vociferous crowd and unfazed by Lee being hit near the eye by a smash from Li Tian. They led 11-6 at the interval but the Chinese team crept back up and finally tied it up at 16-16. Both teams were diving for every shuttle and fighting hard for the win. The Chinese took the lead for the first time in the game at 18-17 and a rally of quick low drives at the net finished it at 21-19 for China.